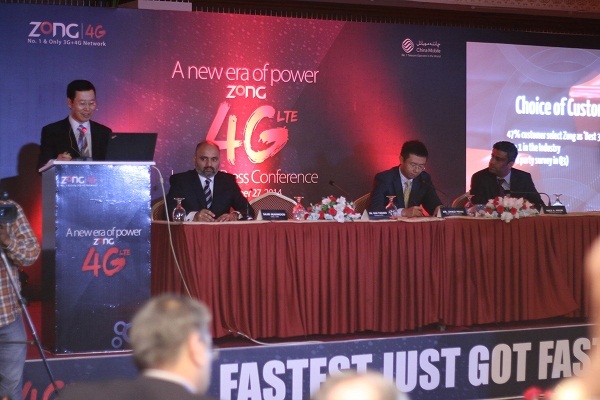 CMPak’s Pakistani cellular wing, Zong, has made its 4G LTE services commercial in Pakistan at a launch ceremony organized in PC Hotel Karachi. As soon as the 4G LTE services go under in the country, Pakistan joins the league of 76 countries having LTE networks. Dr. Fan Yunjun, CEO, China Mobile Pakistan, Dr. Zhao Peng, CCO of CMPak, Mr. Sajid Mehmood, Chief Network Officer and Chief Regulatory Officer, Mr. Niaz A Malik, CIO and Corporate Chief Sales and Strategy were the dignitaries present at the launch ceremony. Dr. Fan expressed his gratitude by saying that Zong’s technical and commercial staff is all set to unleash the 4G LTE services in seven cities during the inaugural stage of its launch. Dr. Fan said that Zong is going to invest almost 1 billion dollars in Pakistan over the span of three to four years. He added that his firm is committed to add 4,000 fresh cell sites to the network by the end of 2014. He elaborated that 4G, 3G and even 2G networks will be integrated over the time. Zong’s CEO also said that his company is focused to design the strongest digital ecosystem in Pakistan to get maximum benefits out of next-gen cellular networks. Dr. Fan mentioned that nearly 866,000 3G customers have been added to the Zong bandwagon. Zong is going to lock horns with Warid Telecom, which has also announced to roll out its 4G facility with-in two weeks from now. Not to mention, Zong was the only operator to get a 4G band license in this year’s next generation auctions held by Pakistan Telecommunication Authority. Zong has also asked its customers to get 4G enabled SIM available at customer care centres starting next week. • You can subscribe to one of these 4G-enabled bundles to activate 4G services. • The 4G-enabled bundles can be subscribed by both prepaid & postpaid subscribers. • The 4G enabled bundles can be used in 4G, 3G & 2G areas. There are two additional hybrid bundles offered by Zong. Monthly data limit on these hybrid bundles is 2GB and 4GB, while they offer unlimited on-net calling and 500 SMS a day. Both bundles are priced at Rs. 599 and Rs. 799 per month respectively.